making it the most cost effective drinking water for storage available. 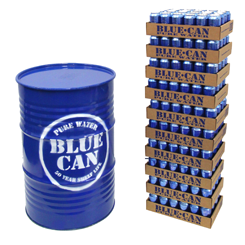 It is our mission at Blue Can Water in Los Angeles, California, to provide long-lasting, great-tasting, emergency drinking water in aluminum cans. A better alternative to plastic water bottles, our canned water is purified using a state of the art high-tech filtration system. Blue Can water is then sterilized and hermetically sealed in aluminum cans under pressure, allowing our premium emergency water to store safely for decades. Be ready for emergencies such as hurricanes and earthquakes with our purified canned water. Thanks to its 50-year shelf life, our premium water is ideal for disaster preparation for individuals, businesses and institutions such as Hospitals and Government Agencies..
Make sure you have enough emergency water supplies for your whole family or business. 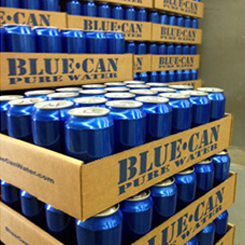 Blue Can Water provides a wide variety of cases and pallets sized to meet your hydration needs. When disaster strikes, you'll have peace of mind. It's easy to order our emergency canned water when you buy it on Amazon™! Proud supplier to FEMA, NASA, U.S. Department of Homeland Security.